The centrepiece of this new disc of music by Bob Chilcott is the cantata The Angry Planet, subtitled An Environmental Cantata performed by the BBC Singers, the Bach Choir, the Young Singers, London Youth Choir, and the Finchley Children's Music Group conducted by David Hill. It is paired with two more of Chilcott's environmentally themed works performed by the BBC Singers and members of the Finchley Children's Music Group conducted by David Hill. In all, there is nearly two hours of Bob Chilcott's music on the Signum Classics set, produced in association with BBC Radio 3. Bob Chilcott is very much the go-to composer for popular classical music for amateur choirs, almost seeming to be taking on the mantle of John Rutter but writing in a different vein. Those of you who have enjoyed is popular shorter works in performance might quail at the thought of two hours devoted to music of a similar style. But works on this disc, though approachable and highly singable, are also extremely thoughtful. All three are written with words provided by Chilcott's regular collaborator Charles Bennett and all three display something of an environmental, almost political concern. But the character of the pieces comes partly because Bennett's words are not polemical, they are highly poetic, he writes allusive lyrics which need thought when listening to them. 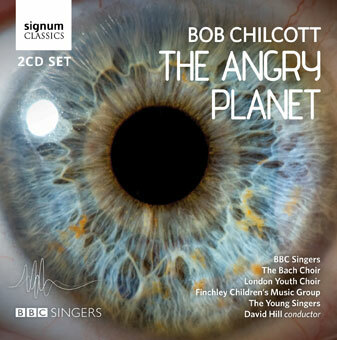 The Angry Planet was commissioned by the Bach Choir in 2011 and first performed at the BBC Proms in 2012. David Hill (conductor of the Bach Choir and of the BBC Singers), had the idea of commissioning a piece which would involve both groups, plus a youth choir and a children's choir in a work which addressed environmental issues. And the other two works on the disc were written for youth choirs, so that this is another thread linking them, though here the works are sung by the BBC Singers. Five Days that Changed the World was written for the Worcester International Festival for Young Singers which took place in 2013. The work had to be on a unifying theme, as it was to be sung by 400 young singers from 11 countries. Chilcott and Bennett chose the idea of five moments in time which affected human progress - five days which changed the world, the invention of printing, the abolition of slavery, the first powered flight, the discovery of penicillin and the first man in space. Here the pieces are sung by the BBC Singers with the Finchley Children's Music Group, Gemma Benson piano and Markus Gruett timpani. I saw them walking like footprints in the snow. Saw them walking into houses all over the world. Open the door of the eye and let them in. Simply, these do not come over in the performance and you can only really appreciate it by being glued to the printed texts. The same fault hangs over the highly effective The Miracle of the Spring. This piece, written for the choir of Magdalen College School in Oxford in 2013 deals with issues of water, particularly shortage, via a series of five poems about trying to find water. The percussion parts are relatively straightforward as they were intended originally to be played by the children of the choir, Chilcott uses quite simple but effective means to depict things like the flow of water and the dryness of the ground. The result is five nicely contrasting and well structured movements, full of variety from the delicate textures of the opening chorus to the more lively rhythmic moments. There are some catchy bits, but the ending The Voice of Water is completely magical. It would have been even more so, if the text were more prominent. The cantata The Angry Planet was recorded by the performers who gave the first performance of the work so it should be definitive. At the risk of sounding like a broken record, the problem here is the same as in the earlier works as the diction is just not clear enough on the recording for the words to be followed with any clarity. That said, Chilcott has created a highly lyrical, elegiac and lovely work. Consisting of four parts, each with three movements thus making 12 in all, the movements follow the flow of events in a forest over a span of 12 hours during the night and loss and fracture are traced through the voices of creatures in danger of extinction. Chilcott uses his forces with great imagination, at various points the youth choir speaks text which give voice to the various animals in danger ending with a very moving litany of all the animals that have become extinct. But this spoken texture is woven imaginatively into the whole, so that it feels highly natural and very satisfying. Similarly the children's choir sing relatively simple songs playing the role of hardy weeds which have managed to survive; Bennett's text here is highly aphoristic in its word-play so you have to work out what the plant is. Though there are a whole variety of textures and tempos in the work, ranging from quietly intense to vividly violent, with a nod at a robust scherzo in the middle, the overall tone is one of melancholy, elegiac lyricism. Towards the end I did worry whether the piece (lasting over 45 minutes) might be over long but I would be extremely interested to hear it live, and perhaps with a better articulated text some of these sections would become more vivid. Particularly you feel that this performance is prizing musical qualities such as line, lyricism and beauty of tone over those of vividly projected text and vibrant message. This is a highly moving work which deserves to be heard.